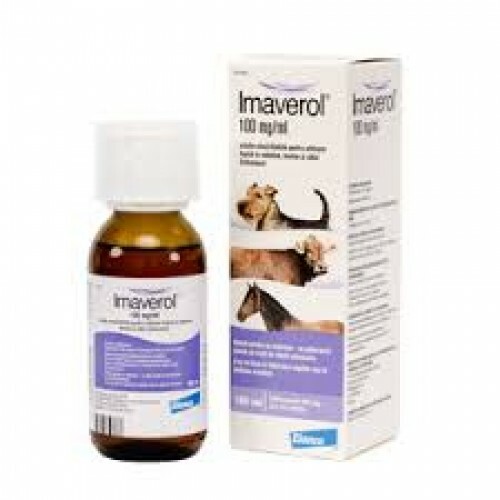 Imaverol is a topical antimycotic for use against ringworm and other forms of dermatomycosis (fungal infections of the skin) in horses and dogs. Imaverol is a synthetic antimycotic. It is indicated for the treatment of dermatomycoses in horses and dogs induced by the following pathogenic fungi: Trichophyton verrucosum, Trichophyton mentagrophytes, Trichophyton equinum, Microsporum canis, Microsporum gypseum. Ringworm can be contagious and requires immediate treatment to prevent further infection. The solution must be diluted before use. Wear suitable protective clothing including impermeable rubber gloves and safety glasses. If the concentrated solution comes into contact with the skin, remove any contaminated clothing immediately and wash skin generously with soap and water. In the event of accidental eye exposure, flush eye thoroughly with running water. If irritation persists, seek medical attention. In the event of accidental ingestion, flush mouth with plenty of running water and seek medical advice. Laboratory studies in rodents have not produced evidence of embryotoxic or teratogenic effects. This product may be given to pregnant and lactating animals. Care should be taken to ensure Imaverol emulsion is not allowed to contaminate the teats and milk. None known. Enilconazole as a 2mg/ml emulsion is well tolerated. Supportive treatment as required. Any unused product and empty containers should be disposed of in accordance with guidance from your local waste regulation authority. Do not allow the product to contaminate streams or water supplies. To be prepared and administered in adequately ventilated surroundings. The concentrated Imaverol solution should be diluted by adding 1 part to 50 parts of warm water, to provide a 2mg/ml emulsion (0.2 % w/v). Dermatophytes will extend into the hair follicles. Possible crusts must therefore be removed with a hard brush, which has been soaked in the diluted Imaverol emulsion. It is highly recommended that the animal be sprayed entirely at the first treatment so as to reach the subclinical lesions as well. The lesions and surrounding skin should be washed with the diluted emulsion 4 times, at 3-day intervals. The animals should be washed with the diluted emulsion 4 times, at 3-day intervals. While doing this, one should rub thoroughly in the direction opposite to the hair growth to make sure that the skin is thoroughly wet. For the same reason, it is recommended that long-haired dogs be clipped before treatment. Alternatively dogs may be dipped thoroughly in a bath containing the prepared emulsion.